I consider myself picky when it comes to selecting makeup. I have tried many brands and types over the years some good and some bad. 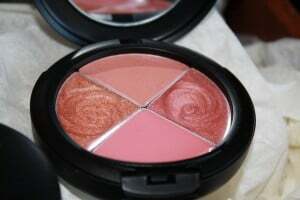 However, I am always open to try new colours, brands and types of cosmetics. If it’s easy to use, looks good and is affordable, then it’s a keeper! These past few years I have discovered mineral makeup and it’s become my preferred choice. My skin is very sensitive so mineral makeup seems to be the only thing that won’t irritate it. I recently discovered Veeve Cosmetics, a line of mineral based makeup that was created by expert makeup artist, Jennifer Stoller. She took her knowledge and put it into action by building a premium quality brand. Veeve Cosmetics has NO fillers, talc, preservatives, perfumes or dyes which are all things that can be very irritating for a person with sensitive skin. Instead, it has only “the good stuff”- a mix of zinc oxide and titanium dioxide. Their collection consists of everything a girl could ask for- concealers, blush, lipstick, lipgloss, mascara, foundation and much more. 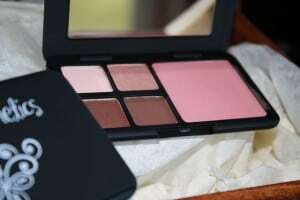 Jennifer sent me the neutral palette consisting of three eyeshadows, a blush and a lipgloss. The palette is thin, small and super cute! It can easily fit into a pocket or a purse and will not add bulk. This is a plus when you are going out and want to do a touch up. No one wants to walk around with a huge, heavy compact in their purse. It comes with a mirror inside which is great when you are on the go. The blush suits my pale complexion perfectly. It’s a pretty soft pink that adds a hint of colour and it goes on so nice! My skin is acne prone so it does get irritated easily, but I was completely fine with this blush. The lipgloss is a warm pink rose colour. This is exactly the kind of colour I like- I want it to be subtle, but still accentuate my lips. I was very impressed with how long lasting it was. Seriously! I applied it and hours later it was still there. My favourite was the eyeshadows though. There were three of them a soft beige with a hint of sparkle (my fave), brown and black. They go on beautifully and you don’t need to keep applying it because it doesn’t fade after a few hours. I have used some eyeshadows in the past where you apply it then you can barely see the colour. With Veeve Cosmetic’s eyeshadows, the colour shows right away and it applies evenly. I couldn’t have found better colours for me. I have blue eyes and wear glasses so it’s an extra challenge for me to make them “pop”. John even noticed when I put it on and asked where I was going! He normally never notices anytime I do anything with my makeup!! I am very impressed by Veeve Cosmetics. Their collection is amazing and their prices are affordable. I will definitely be back to buy more and try some of their other products. I would like to try the Onyx mascara. i would love to try the lip liner and lip gloss! Wundercover Concealer is something I’d like to try! like you on fb-gloria m.
I’d love to try the GoGo lipgloss; such a pretty color! I think I’d like to try their lipstick. I would like to try the sable mascara. I would like to try the Mineral Mist. Follow Veeve Cosmetics on Twitter (@spelena). I like Simply Stacie on Facebook (Elena Shkinder-Gugel). I like Veeve Cosmetics on Facebook (Elena Shkinder-Gugel). One of my favorite products in your store is the Coco-Zen – Chocolate Body Gift Set: Head-To-Toe.